Today our star ferry ride was on the lower class deck which is a hell of a lot noiser, smellier and worst views. But if you want to save 50 cents then it’s the only way to travel. We were reaching the end of our original $100 HK on our octopus cards so they needed some filling. 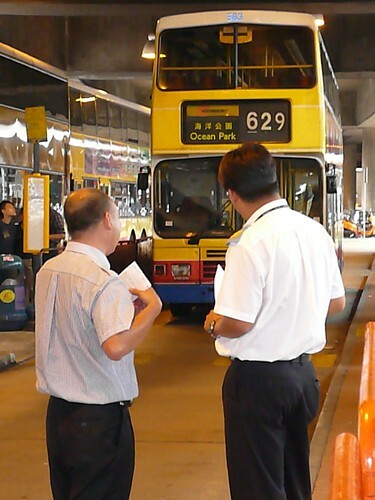 Once on Hong Kong Island we took a walk to Admiralty MTR station to fulfil that duty and catch the bus to Ocean Park. 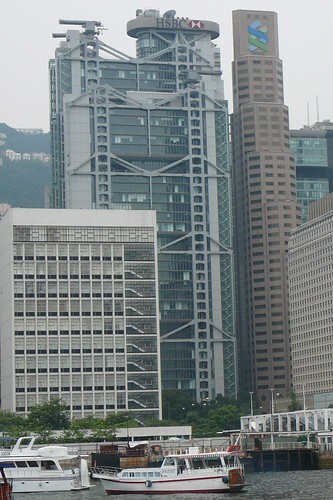 Our walk talk us past the HSBC building which stands out across the harbour from Kowloon. It’s most well known for the fact that all it’s airconditioning vents run on the outside which gives it it’s distinct criss cross shape. It was also built rather like a lego set that it can be pulled apart and rebuilt elsewhere. The rumour is that it was made that way just before the chinese took over so that if it all went crazy they could get the hell off the island. It is guarded by two lions at the bottom and entry is via escalators to the first floor. They even make money inside the bank as HSBC is one of three banks allowed to print Hong Kong currency. You might be able to guess that I’m pretty fond of the building. 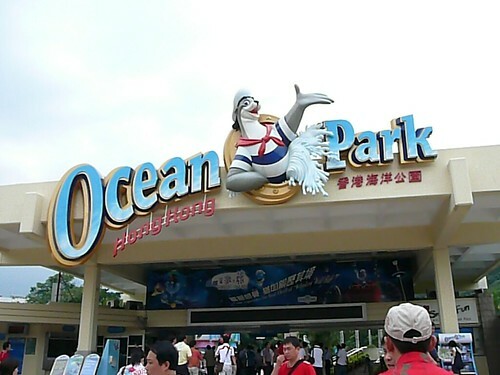 We easily found the bus to Ocean Park in the Admiralty Bus Terminal as there was a huge Ocean Park sign. I tried to use a 10% off discount there but she told me I had to catch the bus there and get the tickets on site to achieve the discount. It wasn’t until we got on the bus that I realised it was a better deal to buy the tickets there and get the bus trip included than it was to get the 10% off after paying my bus fare. Live and learn. The bus ride to Ocean Park was cool because we were up on the top floor and got to see a lot of Hong Kong Island on the way. The route took us down busy streets and then on to a toll road that tunnels under the mountain throwing us out on the other side of the island near Aberdeen. Of the bus we bought our tickets and found a lot of the rides weren’t working as they were preparing for the Halloween bash. I don’t know what kind of bash it is to shut down rides 2 months before the party, but whatever. The entry wasn’t awe inspiring so in the heat we wandered up to the Giant Panda Enclosure. Thankfully Pandas also enjoy the cool air so it was nice to lower the temperature for awhile. 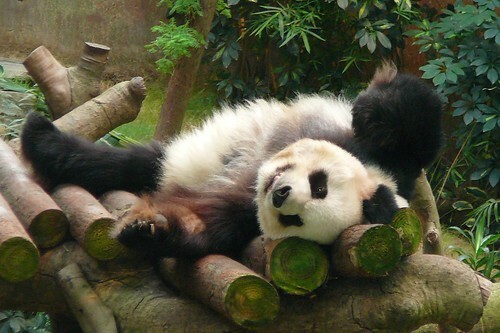 Unfortunately the pandas weren’t using that cool to be active, they were just laying around sleeping. I took a hell of a lot of photos hoping for them to wake up, but alas, they didn’t consider guests coming all the way from Australia as people worth getting up for. 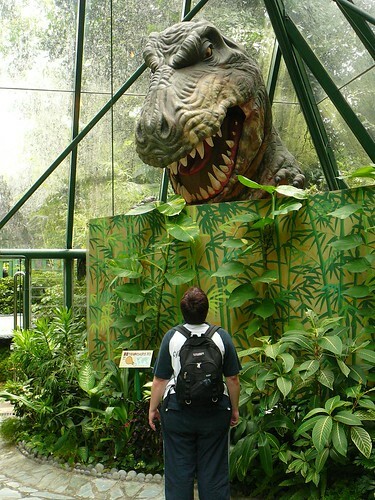 The dinosaurs now and then display was a little lame – just some fish, a few strange reptiles, crocs and a robotic t-rex that comes and yells at you. Pauline wasn’t scared though and stared him down. 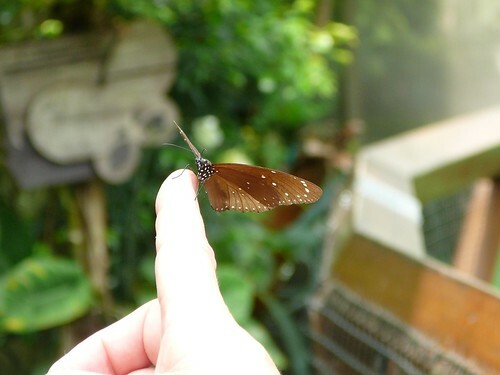 I thought there would be more butterflies in the butterfly enclosure but the ones that were there were pretty friendly. A german lady managed to get one on to her finger. We waited first in line in Amazon 3d encounter but when we got inside all it was was coloured neon paint that was meant to be 3d. The thing that was most realistic looking was actually 3 dimensional when I touched it. When we left Pauline said it was a four letter word starting with L and ending with E. The pink flamingos outside made up for though. 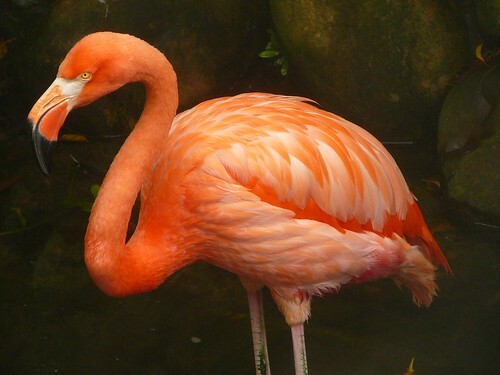 They were a much more vibrant pink than the one we saw in Taronga Park Zoo in Sydney. Makes me wonder if when they get older they start to fade in their colours. 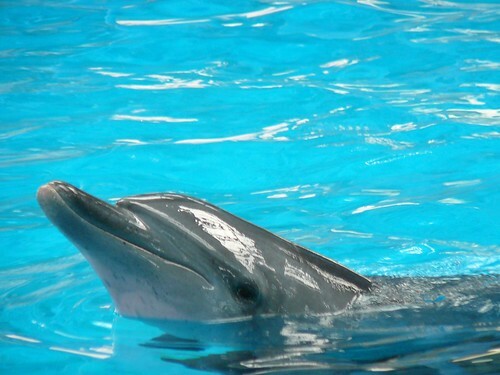 Since it was nearing 1.30 for the Bird Theatre we killed time by visiting the dolphins. All they seemed to do was swim around in circles looking at us when they noticed we were there. I think you can actually swim with them if you pay out the cash but we weren’t interested despite the heat. The bird theatre was primarily in chinese but the guy did pull out some english every once in a while. 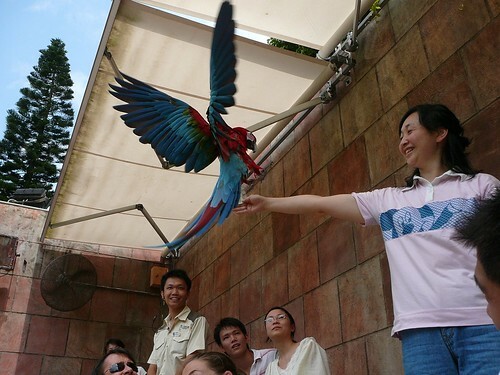 They showed us an owl, cockatoos, the macaws we met earlier and an eagle. 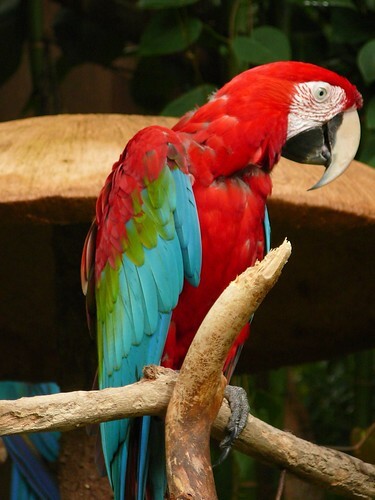 The most fantastic part though was when the three macaws flew around the theatre over our heads – that is the best way to see birds rather than on someones hand, they look like they are having the most fun up in the sky. Once over we raced around the corner for the seal show which was primarily about how they train seals to perform. Which is kind of bizarre to give away their tricks. The trainers were quite funny, a lot of asian performers (even on tv ads) use overstated movements and leggy dancing to get their point across. It looks really silly so that they will never have an ounce of cool but it certainly makes you happy. After the show we took a cable car ride up to the upper section of the park since we had explored everything in the lower half. 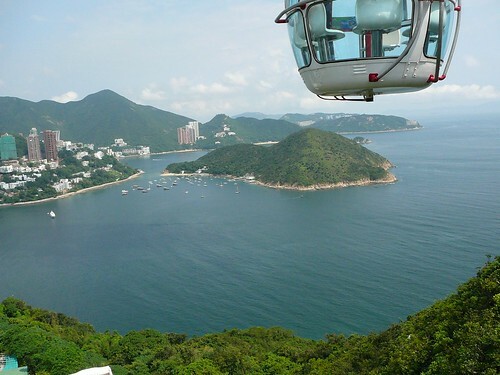 The view from the cable car is fantastic as you can see deep water bay and all the shipping boats in the shipping lane. 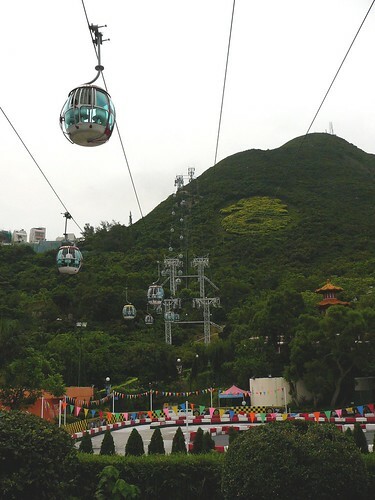 It takes about 10 minutes to get all the way there and by halfway you feel really serene as the only sound is when your cable car goes past the towers. 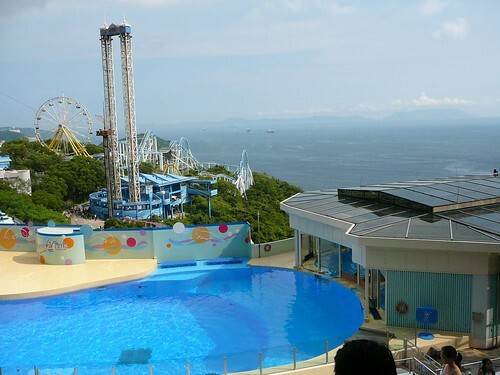 Once off I raced around to the Ocean Theatre to see the Dolphin Display only to have Pauline point out that we still had an hour to go. So we fed our stomachs with hotdogs and cokes (standard theme park fare) then staked out our place in the theatre. 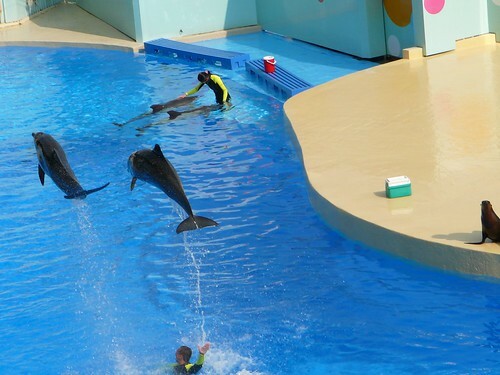 The theatre is huge as they only do two displays a day and was packed by the time the dolphins and seals came out. If you’ve been to Sea World on the Gold Coast then you pretty much know the drill except that Sea World doesn’t sit on top of mountain surrounded by sea with huge ships coming past. As soon as the show was over we went over to the raging rapids ride with is like the Dreamworld log ride which was primarily just so we could get wet thanks to the humid heat we were still dealing with. We then took the escalators up to go to the revolving tower ride which just takes you up a tower and then revolves so that you can see Aberdeen and even China on a clear day. 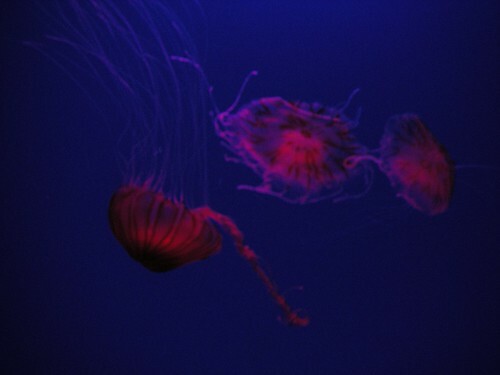 Then we visited the sharks, atoll reef and jellyfish. By then my camera’s battery had run out so we were trying to use Pauline’s to get some photos of the jellys. We’ve loved them since we saw them in Monterey but because her camera doesn’t have a high iso (or tripod) all we got were blurry colours. The atoll reef was really well done, you walked along three levels which allowed you to see the top of the reef, then the middle, then the bottom showing you all the fish that lived at each of the levels. By now it was getting late so we lined up at the cable cars along with the millions of other people also leaving. Despite the crowd they were allowing you to choose how many people to a car, so the guy two ahead of us got his own. The girl in front of us was going to be by herself until we decided we were tired of waiting and letting other people wait so we got in with her. We were so tired that we didn’t say anything to her let alone each other so we were surprised when we got off that she ran passed us with a huge friendly grin saying bye bye with a wave. 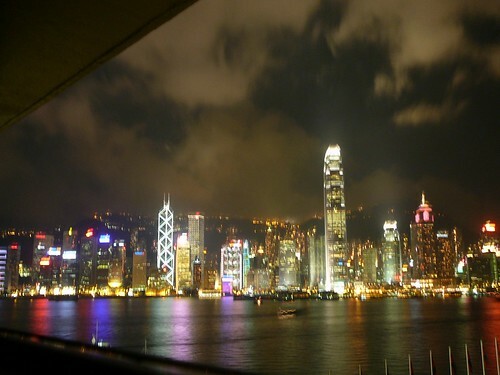 It was totally unexpected and nice which was typical of the way we were treated by most Hong Kong people. For dinner we had pizza from the California Pizza Kitchen again. A bit of a waste I know but the first one was so damn fine that we decided this time we’d dine in. They have free refills for soft drink but I had a long island tea (this one wasn’t very nice) and Pauline had a beer. For entree we had some really nice avocado bacon wanton things which were yum, then the Santa Fe Pizza for mains. They haven’t quite sorted their table delivery methods though because we got them at the same time. For dessert I wanted Key Lime Pie but they had run out. He informed me that they would have a shipment of them delivered at 12pm that night but too late for me! Instead we found a Ben and Jerry’s ice cream shop which gave me a huge thrill – like a child. I enjoyed the New York Super Fudge Chunk and the Phish food (it had little chocolate fishes in it) while Pauline went for the coffee and something else. I’ve had their ice cream before on the corner of Haight and Ashbury but I enjoyed this one a lot more – maybe because it was summer.